Author Geoff Partlow will be at the Carbondale Barnes & Noble on Thursday, August 28, at 5 p.m. All are welcome. Partlow is the author of America’s Deadliest Twister: The Tri-State Tornado of 1925. 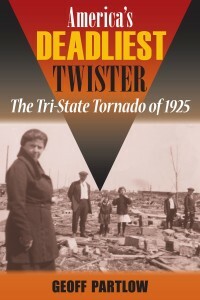 The book draws on survivor interviews, public records, and newspaper archives to offer a detailed account of the tri-state tornado of 1925, which gouged a path from southeast Missouri through southern Illinois and into southwestern Indiana, hugging the ground for 219 miles, generating wind speeds in excess of 300 miles per hour, and killing 695 people. Partlow follows the storm from town to town, introducing us to the people most affected by the tornado, including the African American population of southern Illinois. Their narratives, along with the stories of the heroes who led recovery efforts in the years following, add a hometown perspective to the account of the storm itself. This entry was posted in Events, Illinois, Regional by admin. Bookmark the permalink.